Some young Catholics that I know are throwing a party tonight. Why are a group of friends having a party on a Monday night? Because it is the Feast of St. John Paul II. Most of them were probably under ten years old when John Paul II died, but these young people have a profound affection for him. I love that they love him. I'm sure many of them went to Mass today. Some of them probably went to confession today. Some of them have been praying a Novena for the past nine days to St. John Paul II. John Paul would have loved that. What am I saying? John Paul does love that. And, he would love that these young people are having a party tonight. John Paul was my pope growing up. It's difficult to put into words, but John Paul inspired the youth to trust the truth. There was a lot of craziness in those days; people proposing various opinions as Christian Faith that were clearly not. For many of us, while we did not possess yet the capacity to make cogent and convincing arguments, we did have an innate sense of what was true. Standing on the side of truth, however, often came with a cost. Just to give a small example: When I was first in seminary, seminarians who requested to have more frequent adoration of the Eucharist (in those days we had it once a month) would have been looked upon by some as "trying to turn the clocks back." Being young and facing the opposition of those with more knowledge, more power, and more experience was intimidating. For many of us, however, we could have faced all of the opposition in the world because we knew that John Paul II was at our side. The Truth was not a battering ram. It was beautiful and attractive. The Truth spoke to the deepest desires of the human person. Yes, it was, at times challenging and required sacrifice, but John Paul exuded a confidence in the human person. We are indeed capable of living the Truth. The Pope, he was on the road with us. He was following Christ with us. He was at our side. He did not give up on us. While others were trying to give us the easy way out, he told us that we were capable of great things, all of us. Christ loved us and wanted to give us everything. And, Christ wanted everything. The Pope told us that we must lay down our lives for Christ, for the Gospel, and for our brothers and sisters. "True love is demanding. I wold fail in my mission, in my journey, if I did not clearly tell you so," he said on Boston Common in 1979. He roused us to greatness. John Paul II trusted us. He trusted that if we heard the full truth, we'd follow. He trusted our freedom. He even won over many of those who had originally feared the new enthusiasm that his pontificate infused into the youth. 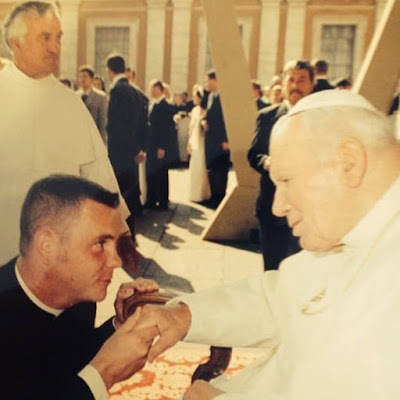 John Paul II was an encourager. Christianity was exciting. It was an adventure of following Christ, laying down your life, and doing great things. It was an adventure that demanded everything from us. Marriage? It was an adventure of two spouses laying down their lives for each other and for their children. Religious life was to give up everything to follow Christ. Priesthood, was to lay down one's life for the flock. If one were to remain single, it must be so that he or she would give himself or herself away in some noble purpose for the sake of others. He encouraged the young and the old, the infirm and the poor. He encouraged all of us to follow Christ, to open our hearts to Him, and to make something great of our lives. John Paul II is still speaking to the hearts of the young. His words still echo throughout the Church. The young men and women who are having some beers tonight and toasting JP2, they are still moved by his example, stirred by his words, and consoled by his prayers. They are still living the Christian adventure. They are not discouraged, disheartened, nor are they afraid. They are men and women who pray together, serve together, go to adoration and confession together, and who evangelize together. They are having a party tonight because to follow Christ is a joyous adventure. At Mass tonight, I prayed for them and for our whole community. At the altar at Mass tonight, I prayed especially for a few more priestly vocations from our BU family. St. John Paul, in this world, you stirred the hearts of young people to greatness. You encouraged us and reminded us that there is nothing greater possible than to open our heart to Christ and to lay down our life for the Gospel and in the service of our brothers and sisters. I pray to you now. I ask through your intercession, that a new wave of vocations, especially to the priesthood and to the Archdiocese of Boston is raised up. I ask you to remove all fear from those whom Christ is calling. Let them be bold and confident. St. John Paul II, Holy Father, let them know that you are walking with them, directing them to Christ. Let them heed the call of Christ. Amen. The youth of my day would often chant, "JP2, we love you." Tonight, some of the youth of today, are still expressing their love for JP2. And together with JP2, they are loving Jesus Christ who is the same yesterday, today, and forever. Amen.